Woodblock print by Utagawa Toyokuni I, 1801-1802. 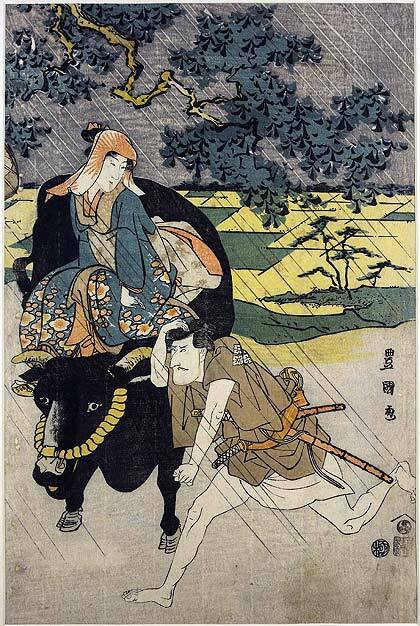 Thirteen famous actors sheltering from the rain under Ginkgo tree, one of the female impersonators on a black ox. Kabuki. Oban triptych. Nishiki-e on paper. 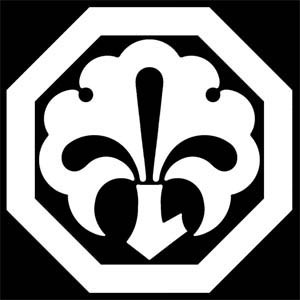 Edo. 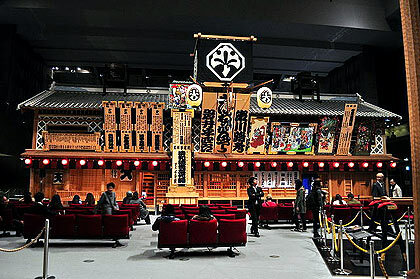 Edo-Tokyo Museum - replica of the Nakamura-za Kabuki Theater in Sakai-cho, Edo (now Nihonbashi-Ningyo-cho, Tokyo). The Nakamura-za (founded 1624) was one of the three main kabuki theatres of Edo. It was founded by Kanzaburō Nakamura. The Nakamura family of the Kabuki theater had a "mon" representing a Ginkgo leaf shaped into a crane and put it on a flag. Read more on my website: Art-page. 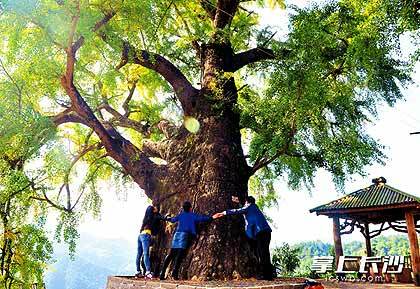 This female Ginkgo tree is over 1000 years old, six people are needed to surround it. It is 30 meters high and located in Liuyang, Changsha county, Hunan, China. Photo and more info: Hunan online.